We understand the temptation to handle a small move on your own, but hiring professional mini movers can take the stress out of your relocation, ensure everything is packed correctly, and cut down on the need for you to find friends to help you with the heavy lifting. Moving a small apartment or dorm room includes all the same stresses and tasks as moving a mansion—just on a smaller scale. 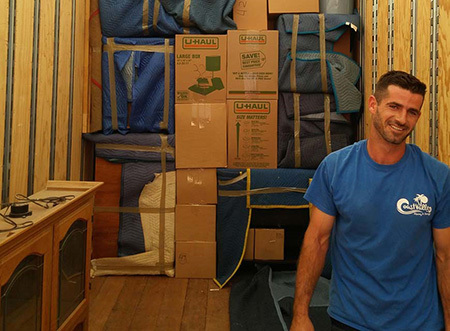 Some moving companies don’t take on a shall shipment or mini move, but Coast Valley Moving and Storage can help. Whether you’re moving a studio apartment or even just shipping a few boxes – or a single piece of furniture - we will move what others won't. Our small shipment specialists will know exactly what you need to do, and how we can solve your dilemma, when moving just a little. Even in a tiny place, you may still have items you no longer use or want. Moving is the perfect opportunity to purge. Whether you toss them or donate them, get a fresh start at your new place without a lot of unnecessary stuff. Should you pack your food? Should you throw it away? Weigh up the cost. If you have organic lentils imported from Sicily that you bought at Whole Foods for $27 then, sure, toss them in a moving box. On the hand, the half-used dollar store box of rice probably isn’t worth the room on the moving truck. If you’d rather not bring any of your food, remember that you can donate unopened, non-perishable items to local food banks. Label any items that you don’t want loaded onto the moving truck, such as baby gear or a bag with prescription medicine. Once the small load movers arrive, they will work fast. If an item doesn’t have a “do not load” label, it will likely end up on the truck. If you wait until the last minute to have the small shipment movers arrive, you won’t have time for cleaning when they leave. Proper cleaning is especially important in a rental when your security deposit is at stake. Do you have just a few too many boxes for your car? Is there a piece of furniture you need to move, on its own? Whatever the need, our small shipment specialists can provide the ideal solution. Since 1972, our goal has been to provide exceptional service to every one of our customers—no matter the size of their move! Our Orange County small shipment movers have years of experience and are trained in proper packing and furniture wrapping techniques, so your items will arrive safely. When you’re planning a mini move, give Coast Valley Moving a call or fill out our online contact form to receive a free, no-obligation estimate!